Congratulations to Megan W. for winning our FINAL COUNTDOWN CHALLENGE! As the top fundraising individual for the Ride for the Cure as of September 14, 2018, Megan won one month of unlimited yoga with Corepower Yoga and a set of Kendra Scott jewelry (total value of $520)*! Fundraising for the Ride for the Cure will remain open until September 28, 2018. Thousands of women and men who could not afford breast health care have received screenings, education and treatments as a result of dollars raised through fundraisers just like you. Join the fight to save lives and end breast cancer forever by committing to a personal fundraising goal today - we need your help to make the biggest impact possible against this disease. Here are some tips from past top Fundraisers. Set a personal goal today (we suggest $360, the cost of 2 mammograms in Chicago). 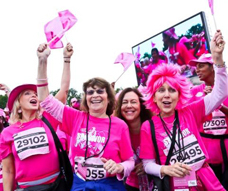 Up to 75% of Komen’s net revenue is used to support local community-based education, screening and treatment programs. The remaining 25% of the net income funds national and global research, turning knowledge into better approaches to treatment, early detection, and prevention, with the overall goal to reduce breast cancer deaths. Learn more about our local grants program and how we serve our local community here click here.